Set a very long time ago, this is the story of the world's first family road trip. When their cave is destroyed, the Crood family must embark on a comedy adventure into strange and spectacular territory in search of a new home. As if dad didn't already have enough to handle, it goes from bad to worse when they encounter an imaginative nomad. 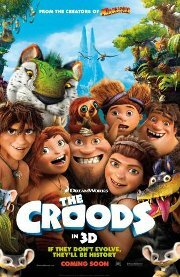 With this nomad's help the Croods conquer their fear of the outside world and discover that they have exactly what it takes to survive: each other. This film is releasing in both 2D and 3D, this is the 3D (recommended) version. Comments The delightful animated adventure movie deals with a prehistoric caveman family whose world is destroyed by an earthquake. They are forced to make adjustments to their attitudes and values.